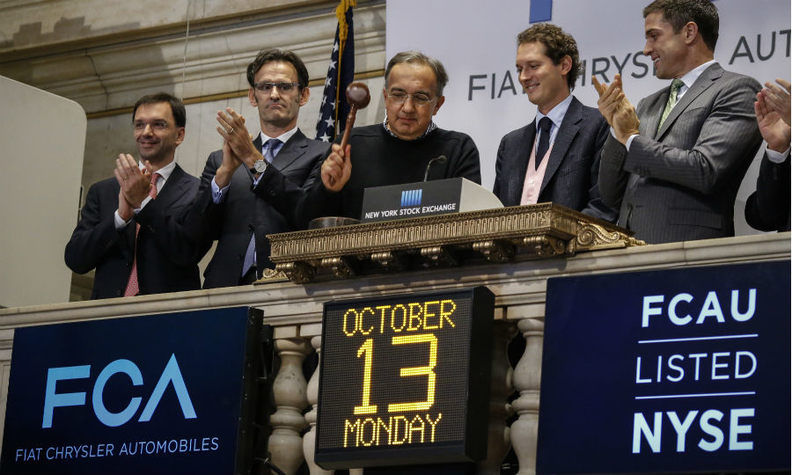 Sergio Marchionne (center) rings the closing bell to celebrate the company's listing at the New York Stock Exchange, watched by Chairman John Elkann (second from right) and Chief Financial Officer Richard Palmer (right). MILAN/NEW YORK (Reuters) -- Investors cautiously greeted the Wall Street debut on Monday of Fiat Chrysler Automobiles (FCA), a move that shifts the carmaker's center of gravity away from Italy and caps a decade of canny dealmaking and tough restructuring by CEO Sergio Marchionne. "We're finally taking Chrysler back" to the U.S. stock market, Marchionne said on the floor of the New York Stock Exchange. "One of the Detroit Three is coming home." Investors in the United States and Europe approached the new listing gingerly, as analysts expressed reservations about the company's prospects. Trading was muted, with about 5.8 million shares changing hands on the NYSE. Marchionne rang the closing bell at the NYSE on Monday to mark the milestone for the 62-year-old CEO who revived one of Italy's top companies and helped rescue Chrysler along the way. The world's seventh-largest auto group sought the U.S. listing to help establish itself as a leading global player through access to the world's biggest equity market and the cheaper, more reliable source of funding it ultimately offers. Marchionne on Monday said FCA might raise debt funding to help finance its $60-billion five-year investment plan. Fiat took management control of bankrupt Chrysler in 2009 and completed its buyout this year. It is now combining all of its businesses under Dutch-registered FCA, which will have a UK financial domicile and small London headquarters, with operations centers in Turin and Detroit. But Marchionne has picked a difficult moment to woo U.S. investors. Analysts think U.S. car sales are nearing a peak, while Europe is struggling to recover from years of decline and growth in China and Latin America has slowed. "Only those willing to accept the risks of a highly leveraged turnaround situation in a competitive, capital-intensive, highly cyclical industry should consider investing," Richard Hilgert, an analyst at Morningstar, said in a note. IHS Automotive, a leading industry research firm, said on Monday that it expects FCA will miss Marchionne's aggressive sales targets for the company as a whole and several of its brands, including Jeep and Alfa Romeo. IHS "does not currently expect this plan to succeed," said analyst Ian Fletcher in a midday note. The company has projected a 60 percent boost in sales to 7 million vehicles and a fivefold increase in net profit to as much as $6.9 billion by 2018, the year Marchionne has said he would step down as CEO. IHS is forecasting more modest growth, to 5.1 million sales in 2018. Marchionne said "I have all the best intentions" of nearly doubling global Jeep sales to 1.9 million by 2018, but that FCA needs to boost annual China sales of Jeep to 500,000 to meet that target. A second Jeep assembly plant in China will open in 2016, he said. In comparison with GM and Ford, FCA is seen as less attractive because of its aging model line-up, high debt, weaker margins in North America and small presence in China. "Ford and GM offer much stronger cash generation and balance sheets, and are thus in a position to return cash to shareholders, while FCA still needs to raise capital," Exane BNP Paribas analyst Stuart Pearson said in a note. Marchionne hopes to see more than half of FCA stock changing hands in New York instead of Milan, but appetite will take time to build, especially as FCA has yet to switch to U.S. accounting principles and to reporting results in dollars. Marchionne will hit the road next month to spread the word. He believes FCA's cause will be aided by Chrysler's brand strength in the United States, now the main profit center for the combined group.